“Thus says the LORD: Lo, I am about to create new heavens and a new earth; The things of the past shall not be remembered or come to mind. 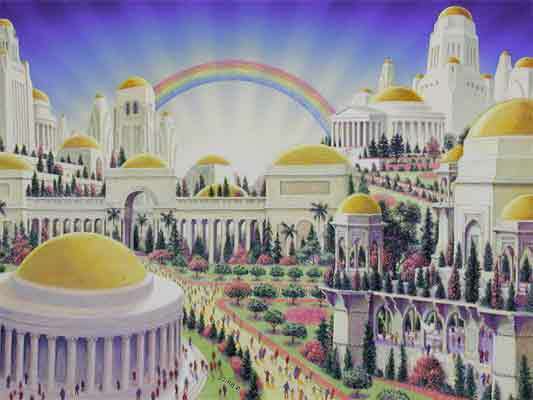 They shall live in the houses they build, and eat the fruit of the vineyards they plant;” -Isaiah 65:17-21. Saint Eulogius was of a senatorial family of Cordova, at that time the capital of the Moors in Spain. He was educated among the clergy of the Church of Saint Zoilus, a martyr who had suffered with nineteen others several centuries earlier, under Diocletian. In his own time still, many Christians were resisting the efforts of the Moors to make the Christians apostatize. Without ever weakening, Eulogius, who was a priest and head of the principal ecclesiastical school at Cordova, combated the perverse influence of the invaders, and it is primarily because of him that the Church saw a new and magnificent flowering of victims immolated for the faith, later to be the source of great blessings for Spain. Eulogius recorded the names and acts of these generous martyrs. In 850, he himself was seized and imprisoned. In prison he wrote his Exhortation to Martyrdom, addressed to the virgins Flora and Mary, who were beheaded on the 24th of November, 851. Six days after their death he was set at liberty. In the year 852 several others suffered the same martyrdom. Saint Eulogius encouraged these martyrs, too, for their triumphs, and was the support of the distressed flock. 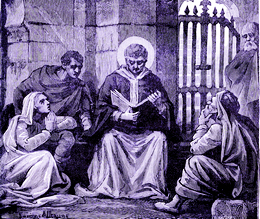 When the Archbishop of Toledo died in 858, Saint Eulogius was elected to succeed him; but some obstacle hindered him from being consecrated, and his martyrdom would follow in less than two months. A virgin, by name Leocritia, of a wealthy governing family of Moors, had been instructed from her infancy in the Christian religion by one of her relatives, and privately baptized. Her father and mother treated her cruelly, scourging her to compel her to renounce her faith. Having made her situation known to Saint Eulogius and his sister, adding that she desired to go where she might freely exercise her religion, they secretly procured for her means of escaping, and concealed her for some time among faithful friends. But the matter was at length discovered, and they were all brought before the Moslem magistrate, who threatened to have Eulogius scourged to death. The Saint told him that his torments would be of no avail, for he would never change his religion; continuing, he exposed vigorously the impostures and errors of the Moslem religion, and exhorted the judge to become a disciple of Jesus Christ, the unique Saviour of the world. At this, the judge gave orders that he be taken to the palace and be presented before the king’s council. Eulogius boldly proposed the truths of the Gospel to these officials. But in order not to hear him, the council condemned him immediately to be decapitated. As they were leading him at once to execution, one of the guards gave him a blow on the face for having spoken against the prophet Mahomet; he turned the other cheek, and patiently received a second. He received the stroke of death with great cheerfulness, on the 11th of March, 859. Saint Leocritia was beheaded four days afterwards, and her body thrown into the Guadalquivir River, but salvaged for burial by the Christians.